Glioma tumours arise from a group of brain cells called glial cells. There are 3 types of glial cell, and if a tumour is mainly made of one of the three glial cells, the patient may be diagnosed with an astrocytoma, oligodendroglioma or ependymoma. However, sometimes it is not easy to tell. What is an unspecified glioma? The term 'unspecified glioma' is one which actually does not describe a single type of tumour. Also known as 'mixed glioma', this type of diagnosis was given in cases where either the doctors could not get a biopsy (sample of the tumour) to test or the biopsy was inconclusive, showing more than one type of glial cell being involved. In its new classification for brain tumours in 2015 the World Health Organization (WHO) did not include unspecified glioma in the list of tumour types because the term doesn't really describe a single distinct type of tumour. The closest thing to an unspecified glioma in the new WHO classification is the oligoastrocytoma which describes a tumour that has both characteristics of an oligodendroglioma (from oligodendrocytes) and astrocytoma (from astrocytes). 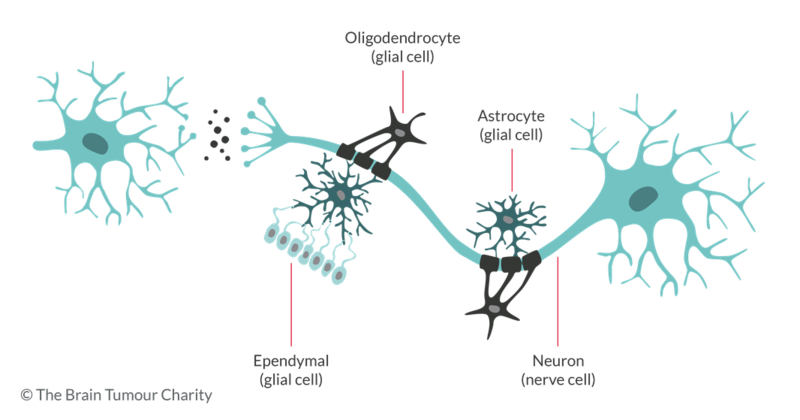 Above: Illustration of the three types of glial cells surrounding a neuron. Biopsies of unspecified gliomas often show the involvement of more than one type of glial cell.